YX series G-10, 20,100,500 small-scale quantitative filling machine is the use of electric, crank, piston-type structural design of automatic quantitative liquid dispensing machines, suitable for hospital preparation room, ampoule, eye drops, a variety of oral liquid, Shampoo and various quantitative filling agent; but also can be used for a variety of chemical analysis of quantitative test in a row plus a variety of liquid fluid, especially for large, medium and small-scale sub-loaded liquid pesticide plant. 5, the speed continuously adjustable, easy to operate. used 5ml syringe; 5-10ml used 10ml syringe; 20ml models, using 20ml glass Enemator; 100ml aircraft, the use of 100ml glass enema device, ( can also use the factory produced a special stainless steel filling system); 500ml models, using a special stainless steel production factory filling system. Device must pay attention to cleaning). At this point liquid injection system assembly is completed. Outwards with the nut fixed on the screw ②. Around, the control card into the chassis and out of liquid collateral ear mouth. On the basis having any error (Figure 4) can be properly installed. System, installation method please refer to 500ml models. When installed the most accurate look at the amount of dosage cups. With the crank set firmly tight. ① the nut tightened only after the boot. Knob clockwise sub-loading speed and slow the contrary. Then screw down the fixed pole and tighten the fastening nut ③. Card into the chassis of collateral ear mouth. Degree should be slower, small-capacity could be appropriately adjusted quickly. In prison, must remove the syringe cleaning. Work, according to (Figure 4) as shown in heavy equipment. Thimble are cutting-edge down, can not install anti-). 1, according to (Figure 4) shows, Loosen the upper and lower set screws, remove the liquid injection system as a whole disinfection, decontamination or demolition respectively. 2, will be placed into the drain pipe cleaning fluid in the boot clean. 3,500 ml filling models in practice there may be errors in the official pre-filling quasi-date with the cylinder volume. 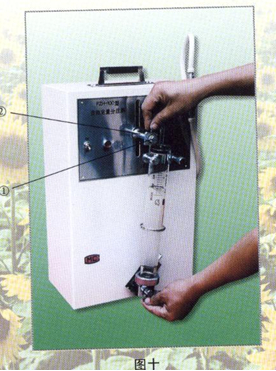 4, filling machine bearing Model: 10 type, 1000087,20 type, 100 type, 1000088,500 type ,6001-ZZ. 5, filling machine needle, 10-type standard 5ml or 10ml syringe, 20ml glass enema with 20-type devices, 100 with the 100ml glass enema device.